Ferndale, MI – Demand was rather high for the Mayor Pingree Red Label Bourbon Whiskey when it made its debut release a few years ago as the first bourbon in the Mayor Pingree labeled collection from Valentine Distilling Co. So much so, that it sold out and hasn’t been on shelves for two years. The reason being, Mayor Pingree Red Label is aged at least 4 years and is a small-batch marriage of Valentine’s finest casks, which are distilled in the Ferndale production facility. Well, it’s time to raise a glass and say cheers, because starting Thurs., Feb. 21 the Red Label is back and in limited quantity. This release of the coveted bourbon yielded 3,900 bottles, and the distribution of this release encompasses nine states including Michigan, Minnesota, Illinois, New York, Maryland, Washington D.C., Connecticut, Delaware, and New Jersey. So, mark your calendars! And keep an eye out for this coveted product on your local liquor store shelves. Information on locations and distributors can be found on Valentine Distilling’s website. The Mayor Pingree Red Label Bourbon is also available for bottle purchase at the Valentine Cocktail Lounge in Ferndale at one bottle per customer. Ferndale, MI – Rifino Valentine has a passion for aviation. As a pilot himself, he appreciates the labor of air traffic controllers, TSA workers, and the many more positions within government agencies that keep air travel safe. In fact, Valentine’s Liberator Gin and Liberator Old Tom Gin are named after the B-24 Liberator heavy bomber, which was a well-known aircraft used during World War II. “I belong to a local flying club and take many short trips, usually with my wife, for fun. On most of these trips, I’m talking to our local Detroit Approach controllers. They do a tremendous job of keeping us safe from other traffic and advisories along our route. They are professional and very helpful. To think that they are still doing their very important job and not getting paid, I thought that this was the least we can do,” said Rifino Valentine, Founder, Valentine Distilling Co.
Valentine Distilling Co.’s Cocktail Lounge located in Ferndale is offering half-off cocktails to federal workers every day, through the government shutdown, to those who present their federal ID. The Cocktail Lounge is located at 161 Vester Street in Ferndale. Hours of operation can be found at valentinedistilling.com. The Beverage Testing Institute awarded Valentine Distilling Co. a Gold Medal for its Liberator Gin during the 2015 International Review of Spirits. And in 2018, Valentine Distilling Co.’s Liberator Old Tom Gin won a Double-Gold medal at the world’s largest gin tasting competition from The Fifty Best. Barrel-aged for two years, Liberator Old Tom Gin is a respectable gin featuring flavors of juniper berries and pine with a touch of vanilla, citrus, cardamom, and cinnamon. Liberator Old Tom Gin has also earned the title of ‘Best Cask Gin in the World’ from the World Gin Awards. It also has received a Gold Medal from the International Craft Spirit Awards. Valentine Distilling Co. reminds customers to drink responsibly. 65 Michigan Applebee’s Locations Enter Craft Cocktail Market with Features from Valentine Distilling Co.
Ferndale, MI – TEAM Schostak Family Restaurants (TSFR), franchisee and operator of Applebee's in Michigan, announces its entrance into the craft cocktail market with its recently-formed partnership with Ferndale-based Valentine Distilling Co. Two craft cocktails featuring Valentine vodka products are now available in its 65 Applebee’s locations in Michigan. A classic Moscow mule featuring Valentine Vodka can now be found on participating Applebee’s menus. And for a twist on the classic mule, a Motown Mule featuring Valentine White Blossom Vodka is also available. Both are served in Valentine-branded, copper mugs. “To kick off the New Year, we are extremely excited to share two of our favorite cocktails with innovative restauranteurs at TEAM Schostak,” said founder Rifino Valentine of Valentine Distilling Co.
As a family-owned company, TSFR purchased the Michigan Applebee’s due to its alignment with their company values of creating a neighborhood dining experience with high-quality food at an affordable price. Recognized as one of The Detroit Free Press’ 2018 Michigan Top Workplace, TSFR is proud to be the local owner and operator of Applebee’s and looks forward to continuing to lead the way both in the restaurant industry and the communities it serves for years to come. Ferndale, MI – As the cooler weather sets in, Valentine Distilling Co., focuses on cocktails inspired by fall-fitting flavors. Toasty pumpkin, cinnamon, apple, allspice, vanilla, and rich ginger flavors invigorate taste buds and warm up the stomachs of cocktail lovers. The following recipes include both crisp and refreshing drinks, as well as snug and cozy concoctions. Enjoy these delicious Valentine Distilling Co. fall-inspired cocktails all season. Start off by creating your own Pumpkin-infused Valentine Vodka. Combine ingredients in a large pitcher, and let it steep for one week at room temperature. Strain off ingredients and keep infusion refrigerated for up to three months. Now, let’s take that infusion to the next level by mixing up Valentine’s top three favorite fall cocktails. Classic cocktails infused with a twist of traditional fall flavors, these drinks can be enjoyed throughout the season. Preparation: Combine ingredients in a mixing tin, add ice, and shake. Rim martini glass by dipping the rim in simple syrup and then into crushed graham cracker crumbs. 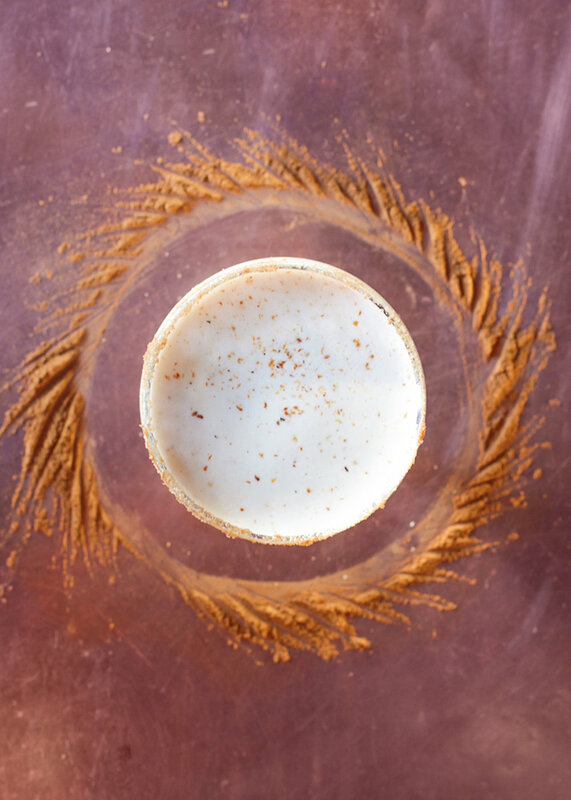 Strain into rimmed martini glass, and sprinkle ground nutmeg on top. 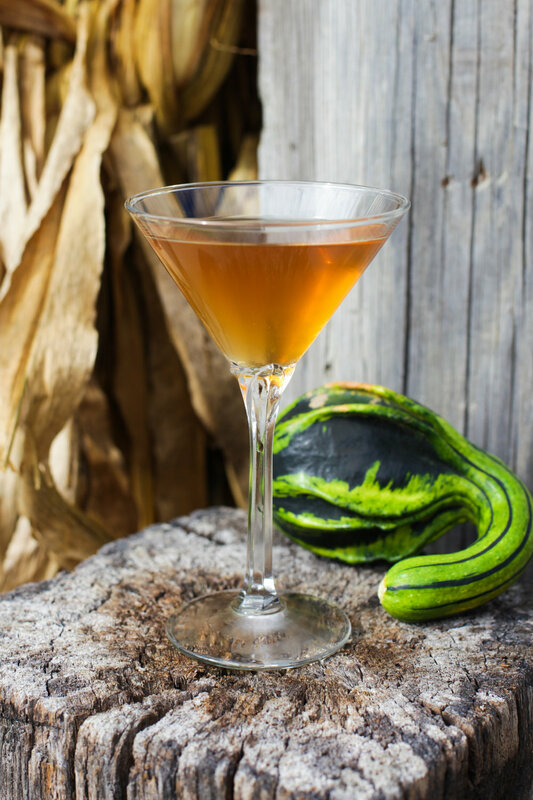 "The fall season brings some incredible new flavors to our in-house infusions, including our homemade pumpkin vodka,” said Heather DeLiso, General Manager at Valentine Distilling Co. “We've created some impressive new cocktails that we can't wait to share!" These fall cocktail recipes are sure to please the casual home bartender as well as the experienced cocktail connoisseur. Established in 2007, Valentine Distilling Co. is an American pioneer of small batch spirits. Valentine Vodka has been named “World’s Best” by The World Vodka Awards in London back-to-back in 2016 and 2017. Also in 2017, Valentine Distilling Co.’s 10-year Mayor Pingree Blue and Black label bourbons received the most prestigious medal awarded, the Double Gold, at the San Francisco World Spirits Competition. In the tradition of Detroit’s manufacturing leadership, Valentine Distilling Co. is dedicated to American ingenuity, quality manufacturing, and small batch distilling using old-world techniques that create superior products. The company’s award-winning vodka, gin, and bourbon are available in seven states, Western Europe, and Ontario. Ferndale, MI – Valentine Distilling Co., known for its world-class, high-quality spirits has yet again made another strategic investment in the company. Valentine is pleased to welcome National Sales Manager, Sarah Warde, to the team. Come early November, Warde will be responsible for brand product market distribution. Warde brings a wealth of beverage industry knowledge acquired from previous experience through her many positions as an Area Manager, District Manager, and On-Premise Sales Director totaling eight years at Great Lakes Wine & Spirits, District Manager for three years at Rodney Strong Vineyards, and as a Sales Consultant for five years at Viviano Wine Importers/J. Lewis Cooper Co.
With Warde’s powerful expertise joining the team, the award-winning craft distillery intends to continue to increase its brand posture and expand into various markets. The National Sales Manager position is a newly added position for Valentine Distilling Co.
Ferndale, MI – It flew off the shelves last fall. So, if you missed it; you’re getting a second chance. The two Detroit-based companies, Valentine Distilling Co. and McClure’s Pickles, have teamed again up to make the perfect Bloody Mary box kit for this season’s football tailgates. Available in limited quantities, the kit comes with two glasses, a fifth of Valentine vodka (featuring a new-and-improved bottle that recently debuted on shelves), and a McClure’s Bloody Mary mix jar for $29.99. It will hit shelves mid-to-late September at many convenient retailers such as Meijer, Kroger, Walmart, and Costco as well as other area retailers while supplies lasts. Masters of their crafts, Valentine and McClure’s have had a lifelong business relationship. Last fall, these two companies teamed up to stand out on retail shelves. Working together for years as friends, and now partners as they continue to collaborate on this product, the two companies have extraordinary synergy and strong dedication to Detroit, and aim to share their spirit with football fans this tailgating season. A family-owned and operated company headquartered in Detroit, McClure’s ensures they get the best, freshest produce available. Every jar is hand packed by one of its talented team members. All products are all natural, gluten-free (pickles, relish, bloody mary, all-natural chips, brine), and kosher certified (Michigan Kosher Supervisors, OU). Distributing to more than 4,000 national and independent retailers throughout the U.S., U.K., Australia, and New Zealand, McClure’s currently produces high-quality, all-natural pickles, specialty drink mixers, and premium salty snacks. Valentine Vodka Has a New Look. Don’t Miss this Fabulous Bottle on a Shelf Near You! Established in 2007, Valentine Distilling Co. is an American pioneer of small batch spirits. When Valentine first started production, there were approximately 15 to 20 micro-distilleries in the U.S. Today, there are more than 2,000 known micro-distilleries in the country. Valentine Vodka has been named “World’s Best” by The World Vodka Awards in London back-to-back in 2016 and 2017. Also in 2017, Valentine Distilling Co.’s 10-year Mayor Pingree Blue and Black label bourbons received the most prestigious medal awarded, the Double Gold, at the San Francisco World Spirits Competition. The company’s award-winning vodka, gin, and bourbon are available in seven states, Western Europe and Ontario. In the tradition of Detroit’s manufacturing leadership, Ferndale, Michigan-based Valentine Distilling Co. is dedicated to American ingenuity, quality manufacturing, and small batch distilling using old-world techniques that create superior products. Local to Global. It’s Better. Ferndale, MI – Valentine Distilling Co.’s Liberator Old Tom Gin wins Double-Gold medal this month at the world’s largest gin tasting competition. The Fifty Best recently hosted a gin tasting competition in New York to evaluate and award candidates on the “Best Gin” of 2018. Judges blind-tasted and rated each of the 68 competing gins individually, based on a five-point system. Double-Gold, Gold, and Silver medals were awarded based on the judge’s impression. The Double-Gold medal is awarded to the best of the entries. Barrel-aged for two years, Liberator Old Tom Gin is a respectable gin featuring flavors of juniper berries and pine with a touch of vanilla, citrus, cardamom, and cinnamon. “We know the difference between good and great, and that is what creates a difference in our product. By crafting a mix of high-quality ingredients and exceptional flavors, we stand out from the rest,” said Rifino Valentine, Founder and President of Valentine Distilling Co.
Only a handful of distilleries in the world produce a barrel-aged gin like Valentine’s Liberator Old Tom Gin, which is Valentine’s Liberator Gin aged in American Oak barrels for two years. Liberator Old Tom Gin has earned the title of ‘Best Cask Gin in the World’ from the World Gin Awards. It also has received a Gold Medal from the International Craft Spirit Awards. A complete list of The Fifty Best winners can be found here. Ferndale, Mich. – EY recently announced that Rifino Valentine, Founder of Valentine Distilling Co. is a finalist for the Entrepreneur Of The Year® 2018 Award in the Michigan and Northwest Ohio Region. The awards program recognizes entrepreneurs who are excelling in areas such as innovation, financial performance, and personal commitment to their businesses and communities. Valentine was selected as a finalist by a panel of independent judges. Award winners will be announced at a special gala event on June 27 at the Detroit Institute of Arts (DIA). Rifino Valentine is an American entrepreneur who has a vision for the big picture and presses above the competition of the highly competitive imported spirits catalogue across the world. Rifino Valentine has a philosophy about manufacturing in this country and specifically in Detroit – a city well-established as the epicenter of quality manufacturing for more than a century. Valentine shows America what true excellence in manufacturing can be when distilled spirits production meets the most vaunted manufacturing capital in U.S. history. Valentine has always appreciated the American craftsman; working by hand, making one-of-a-kind products that stand the test of time. In distillation, this means selecting the best ingredients, distilling in small batches, and taking care in every single step of the process. This leans heavily on employing old-world techniques that haven’t changed in centuries, but improving on them through an intimate understanding of the science involved in the complex and dynamic processes. Valentine focuses on two main goals in his business: to prove the best products are still made in this country – and in Detroit – and that the end-goal of business does not have to be solely about profit. “You can have both – quality and profit,” Valentine remarks. “I am taking a stand against mass produced spirits. I am here to prove that American ingenuity and quality American manufacturing is still alive,” says Valentine. Entrepreneur Of The Year®, founded by EY, is the world’s most prestigious business awards program for entrepreneurs, chosen from an independent panel of judges including entrepreneurs and prominent leaders from business, finance, and the local community. The program makes a difference through the way it encourages entrepreneurial activity among those with potential and recognizes the contribution of people who inspire others with their vision, leadership and achievement. As the first and only truly global awards program of its kind, Entrepreneur Of The Year celebrates those who are building and leading successful, growing and dynamic businesses, recognizing them through regional, national and global awards programs in more than 145 cities and more than 60 countries. Founded and produced by EY, the Entrepreneur Of The Year Awards are nationally sponsored in the US by SAP America, the Kauffman Foundation, and Merrill Corporation. In Michigan and Northwest Ohio Region, sponsors also include Citizens Bank, Colliers International, Foley & Lardner, Oswald Companies and Tanner Friedman. Ferndale, MI - Valentine Distilling Co., one of the nation’s first craft distilleries, is no stranger to national recognition. The American Distilling Institute’s 2018 Judging of Craft Spirits awarded Valentine Distilling 10 total medals including three Best of Category Winners on March 27 in Portland, Oregon. Ferndale, MI – If Valentine Distilling Co. is known for one thing, its world-class, high-quality spirits. The Ferndale-based company’s Mayor Pingree ‘Black Label’ Limited Edition Straight Bourbon received among the highest rankings in the North American Whiskey Review this month. Tastings, host of the North American Whiskey Review, awarded the Mayor Pingree Bourbon Whiskey as an exceptional, Gold Medal winning spirit. With a score of 94 Points out of 100, Valentine’s bourbon was the only Michigan distillery to rank, also beating out other well-recognized brand names such as Jim Beam and Knob Creek while coming in just behind a special release from Wild Turkey. “My goal when marrying these releases is to emphasize the characteristics shared by all fine bourbons beyond just great flavor, aroma and color... qualities of mouthfeel, layering, and linger,” said Justin Aden, distiller and blender for Valentine Distilling Co.
“We are excited to receive this award from The North American Whiskey Review on the heels of our ‘Double Gold’ award from The San Francisco World Spirits Competition that further cements our recognition for the highest quality spirits across our entire product line,” said Rifino Valentine, owner and president of Valentine Distilling Company. Ferndale, MI – Not many things go better together than football and tailgating in Michigan. Until now: Valentine Vodka and McClure's Pickles. The two Michigan-based companies have teamed up to make the perfect Bloody Mary box kit just in time for this season’s football tailgates. Available in limited quantities, the kit comes with two glasses, a fifth of Valentine vodka, and a McClure’s Bloody Mary mix jar for $29.99. It will hit shelves mid-to the end of September at some of Michigan’s most convenient retailers such as Meijer and Kroger while supplies lasts. From first place at the Michigan State Fair in the 1970’s to a feature on The Food Network’s “The Best Thing I Ever Ate,” McClure’s has been making all the right moves. Pairing up with Valentine’s “World’s Best Vodka” – their best move yet. “McClure’s and I understand the value in high-quality, local products. Our companies have seen tremendous growth over the past few years and are making a name for Michigan-made products. We want to show football fans what Detroit products are made of. And what better time than Lions tailgating season?” said Valentine. From production to packaging to placement, Valentine Distilling Co. and McClure’s Pickles are putting every ounce of Michigan into this product. Even the packaging is designed and built by Driven Creative Supply Co., a branding agency located in Pleasant Ridge. “This kit is unlike any other. The highest quality ingredients of two unique products. It’s a win win-win for Michigan and Detroit,” said Valentine. Valentine Vodka has a silky medium-to-full body and a creamy, peppery spice and talc finish. It is derived from a proprietary blend of three grains: corn, wheat and barley. The award-winning company is one of the few distilleries in the world to craft vodka from a blend of grains. Some may not see the correlation between spirits and pickles, but these companies did. Valentine and McClure’s have had a lifelong business relationship. Working together for years as friends and now partners as they collaborate on this product release, the two companies have extraordinary synergy and strong dedication to Detroit. McClure’s company story shows great pride in Detroit – just like Valentine’s. The family pickle company started in Detroit from Grandma Lala’s recipe and making pickles every summer. The family business began to take off in 2006, expanding to a warehouse in Brooklyn, New York, where brother Bob McClure facilitated production. Growing at a rate between 10-25% year-over-year, brothers Joe and Bob McClure remained loyal to Michigan by bringing all production back to Detroit in 2009. In July of this year, the company invested in a local 20,000 sq. foot manufacturing facility by purchasing the building to keep up with high demand. The company has added to its supply of automated systems to increase efficiency, and has avoided cutting any jobs in the process. In fact, the company has expanded to more than 20 employees since its beginnings. “This is two Detroit brands making something pretty damn awesome,” said Joe McClure, Co-owner of McClure’s. Made in Detroit to celebrate in Detroit. Just the way we like it. Information on locations and distributors can be found on Valentine Distilling’s website. Ferndale, MI – Valentine Distilling Co. has added a rye whiskey to its award-winning Mayor Pingree family. The Mayor Pingree Rye Whiskey is a distinct, 90-Proof beverage that is sure to contribute excellence to the collection of Valentine products. The Mayor Pingree Rye Whiskey has a mild auburn color with freshwater cattail stalks, newspaper pulp, hayloft, dusty oak furniture, and caramel candies scents. Its mouthfeel has a round, smooth and viscous front bridging sleekly into an abrupt, keynote rye-spice finish. This is a very friendly and informing pour, excellent for classic rye cocktails. Its Macadamia nut, cashew, rhubarb, and wild honey flavors make it a truly unique beverage that leaves a lasting impression. 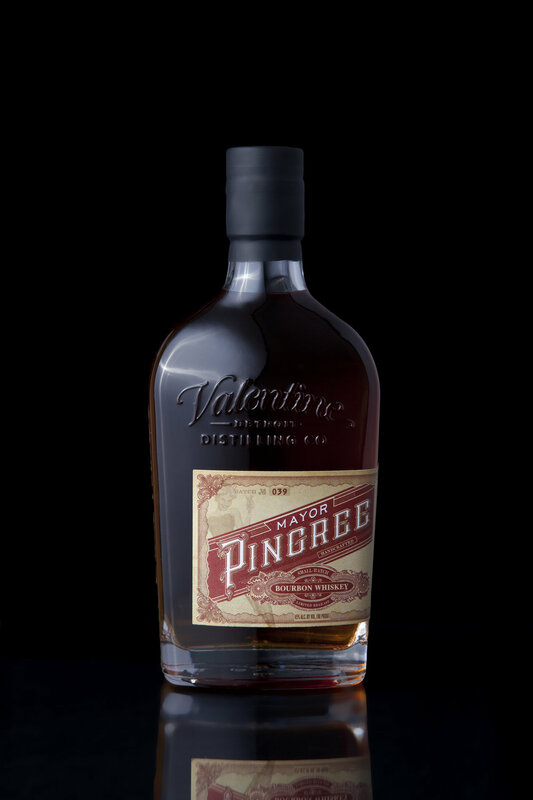 The Mayor Pingree Rye Whiskey 90 Proof’s first shipment has made its way to store shelves, and Valentine will continue to release limited quantities sporadically. “The Rye Whiskey has seen great success in its first couple weeks. I am very excited for the general public to try out our new addition and show what a real rye whiskey is made of,” said Rifino Valentine, President and Founder of Valentine Distilling Co.
“Hundreds of places do whiskey single barrel selections every year, The Liberator Old Tom Gin is the first exclusive gin single cask selection in Michigan and perhaps the country. This selection is a unique addition to the restaurants’ spirits portfolio and to the gin segment in general. I wouldn’t be surprised if this becomes a trend,” said Rifino Valentine. “I've spent more than 20 years dissecting all things drinkable from mineral water and tea to whiskey and wine. I don't care what is popular—I care what is good. When Valentine released Liberator, it became a staple at home and at Trattoria Stella. I was at the distillery when the first batch of Old Tom was in barrel. As soon as it was released, I started buying it by the case,” said Danielson. OTMH welcomes those traveling to Traverse City this summer season to stop in and enjoy this exclusive gin and, of course, a bite or two as well. “We take everything from a wine dinner to a meal to the next level believing boldly in quality from beginning to end. Research, time, and dedication separates us from everyone else. We are proud of raising the bar for restaurants in Michigan every day,” said Danielson. Established in 2007 and among the nation’s first craft distilleries, Valentine Distilling Co. is an American pioneer of small batch, handcrafted spirits. In early 2016, Valentine Vodka was announced as winner of “World’s Best Vodka” and “World’s Best Varietal” by The World Vodka Awards in London. In 2017, Valentine once again brought home the “World’s Best Varietal” vodka award. Most recently, the company received the highest honors for Mayor Pingree Blue and Black Label Bourbons from San Francisco World Spirits Competition, both earning a Double Gold. Valentine Distilling Co. shared its first television commercial with viewers around the world to celebrate being named ‘World’s Best Vodka.” The company’s award-winning vodka, gin, and bourbon are available in seven states, Western Europe, and Ontario. In the tradition of Detroit’s manufacturing leadership, Ferndale, Michigan-based Valentine Distilling Co. is dedicated to American ingenuity, quality manufacturing, and small batch distilling using old world techniques that create superior products. The tasting note for Valentine Vodka reads as follows: "Bright, lifted aromas, clean and a touch leafy. Classical style, with a mouthwatering liveliness to the mid-palate, and good, balanced length." “While we didn't win the overall best category this year like we did last year, we ended up losing to a distillery in the Ukraine that started making vodka in 1872. As far as I can tell, it's not a product currently available in the U.S., so that's good company to keep,” shared Valentine. Ferndale, MI – With 14 years of experience in the restaurant hospitality industry, Laura Shortt has spent six of them bartending and the past two and a half years mastering the art of the craft cocktail. In her new role with Valentine Distilling Co. as Cocktail Lounge Manager, she looks forward to the opportunity to create more cocktail offerings for guests including fresh infusions and in-house made syrups. Shortt is known for her recent award in Detroit art event Plexus, hosted by Jagermeister, where she won the mixology competition with her cocktail “Sheep’s Clothing.” She won this award while working as a bartender at Antietam in Detroit. Laura enjoys cooking and uses the culinary landscape to inspire her liquid creations behind the bar. She is quite the enthusiast of the book Liquid Intelligence: The Art and Science of the Perfect Cocktail by Dave Arnold and looks to it often for new concepts and the science behind the craft. Classic cocktails root back to the basics of the craft and Shortt enjoys turning to those classics and adding a modern twist to them for today’s cocktail scene. Shortt loves to experiment and devise new cocktail creations as part of her passion for bartending. Her newest addition to the lounge cocktail menu includes egg whites. And for the upcoming Valentine’s Day holiday, the Valentine Cocktail Lounge has a special treat for patrons to try. Laura has whipped up a mashup of a Ramos Fizz cocktail with elements of strawberry cheesecake. The cocktail consists of strawberry infused White Blossom Vodka, lemon, honey, mascarpone cream, egg white, and soda served in a Collins glass. For those of you intimidated by the egg white cocktail concept, Valentine has a few options being served up for you as well this coming month. The "Sweetheart" made with strawberry infused White Blossom Vodka, Sweet Vermouth, lemon, and vanilla. As well as the "Black Heart" created with blackberry Infused Valentine Vodka, lemon, beet juice, a dash of balsamic, and ginger beer served in Collins glass. Featured cocktails range from $10-$12 and can be enjoyed exclusively at the Valentine Distilling Co. Cocktail Lounge located at 161 Vester Street in Ferndale. Her outlook to the spirits industry on a national level includes vodka making a comeback as the spirits drink of choice in the next year or so. For a while vodka became less popular and the world revolved around whisky, gin, and rum. But vodka is making a return to the craft cocktail scene; and Shortt is excited to see its comeback. Ferndale, MI – Just as its award-winning products are made in Detroit, so was Valentine Distilling Company’s first television commercial. The 30-second ad presents Valentine Vodka as the “World’s Best Vodka” to viewers. To celebrate this victory, Valentine Distilling Co. has been working the past few months with some very talented individuals who have one thing in common – they’re all Detroiters - to create a spirits advertisement to be remembered. “Being able to create our first commercial locally to celebrate this milestone speaks to exactly what Valentine stands for - dedication to making quality products and showing the world that American craftsmanship and manufacturing exists today,” said Rifino Valentine, Founder & President of Valentine Distilling Co. The commercial features a visit to Vladimir Lenin’s tomb in Moscow. When the “World’s Best Vodka” is announced a tear is shed by Lenin, Russian communist revolutionary and politician, as it is made clear the “World’s Best Vodka” comes from Detroit. Writer Jon Stewart of Huntington Woods and art director Bill Whitney of Oxford teamed up to develop the idea for the commercial. Director Thomas Drew, known for his work for Cadillac, Michelin, the AdCouncil, USPS, and many more, was then added to the team to bring the commercial to life. The set for the commercial was built and the commercial shot at Drew’s studio in Royal Oak. Flynn Drew, Tom’s son, joined the team as Director of Photography for the commercial. After weeks of casting for a good “dead Lenin lookalike,” Jeremy Verdusco happened to ride his bike down Stewart’s street. Verdusco was quickly flagged over and the awkward proposition was made: “You look like dead Lenin, how would you like to play him in a commercial for Valentine Vodka?” Verdusco, already a fan of Valentine spirits, was happy to join the crew. Verdusco, who was officially cast as Lenin in the commercial, also resides in Huntington Woods. “He just happened to be an innocent pedestrian in the wrong place at the wrong time: the shoot required him to spend 10 hours in facial prosthetics and makeup,” remarked Stewart. Makeup and special effects artist Dan Phillips is a nationally-renown practitioner of his art. He has worked on a variety of high-profile productions including The Hobbit. Dan is also a Detroiter. Also on the production team is Kurt Kulas, agency producer, from Birmingham. All post-production was completed in Detroit. Editing, visual effects, audio, and final assembly were executed at Ringside Creative in Oak Park, with artwork by Gecko Imaging in Royal Oak. After many long days of work by the crew, Valentine Distilling Co. is officially ready to share its first television commercial with viewers around the world. Established in 2007 and among the nation’s first craft distilleries, Valentine Distilling Company is an American pioneer of small batch, handcrafted spirits. The company’s award-winning vodka, gin, and bourbon are available throughout the United States and in six other countries. In the tradition of Detroit’s manufacturing leadership, Ferndale, Michigan-based Valentine Distilling Company is dedicated to American ingenuity, quality manufacturing, and small batch distilling using old world techniques that create superior products.